“Seductive Subversion: Women Pop Artists 1958–1968,” the first major exhibition of female Pop artists, takes aim at more accurately reflecting the depth of women’s contributions to Pop Art. “Traditionally, Pop Art has been defined and dominated by a small group of Anglo-American male artists,” said curator Sid Sachs, who has been developing the exhibition for five years. “This show expands this narrow definition and re-evaluates the critical reception of Pop Art. Many of these artworks have not been shown in four decades. “Seductive Subversion” features paintings and sculptures by Evelyne Axell, Pauline Boty, Vija Celmins, Chryssa, Niki de Saint Phalle, Rosalyn Drexler, Dorothy Grebenak, Kay Kurt, Yayoi Kusama, Lee Lozano, Marisol, Mara McAfee, Barbro Östlihn, Faith Ringgold, Martha Rosler, Marjorie Strider, Alina Szapocznikow, Idelle Weber, Joyce Wieland and May Wilson. The University has secured loans of artwork from the National Gallery, Hirshhorn Museum and Sculpture Garden (Washington, D.C.), Neuberger Museum (Purchase, New York) and major private collectors. The show’s main staging will be at the Rosenwald-Wolf Gallery (333 S. Broad Street, Philadelphia), with the Hamilton Hall Galleries (320 S. Broad Street, Philadelphia) and Borowsky Gallery (401 S. Broad Street, Philadelphia) hosting the balance of the art work. The Rosenwald-Wolf Gallery is open Monday through Friday, 10am-5pm and Saturday, noon-5pm. The exhibition is free and open to the public. For information, call 215-717-6480. “Seductive Subversion: Women Pop Artists 1958-1968” was organized by the Rosenwald-Wolf Gallery at the University of the Arts. This project, along with a documentary film by Glenn Holsten, has been supported by The Pew Center for Arts & Heritage through the Philadelphia Exhibitions Initiative, with additional support from the Marketing Innovation Program. Additional funding for the film is generously provided by the Andy Warhol Foundation for the Visual Arts, the Dolfinger-McMahon Foundation and the Quaker Chemical Foundation. © 2010 Niki Charitable Art Foundation. All rights reserved. Escondido, California honors Queen Califia with park statues. “Queen of California,” Queen Califia is on view in Escondido with a mosaic garden sculpture designed by internationally renowned artist Niki de Saint Phalle. She was commissioned to create an interactive sculpture garden at Kit Carson Park inspired by California’s mythic, historic and cultural roots. The installation is known as Queen Califia’s Magical Circle. The garden consists of nine large-scale sculptures, a circular “snake wall” and maze entryway, sculpturally integrated bench seating, and native shrubs and trees planted within the interior plaza and along the outer perimeter. The garden bears the brilliant, unique mosaic ornamentation that is an unmistakable part of Saint Phalle’s later work. Niki de Saint Phalle was a citizen of Switzerland who resided in La Jolla until her death in 2002. She is known worldwide for her work in Europe, such as the Stravinsky Fountain in Paris and a sculpture garden in Italy. The western U.S. state was once described in a novel as an island: “Know that on the right hand from the Indies exists an island called California very close to a side of the Earthly Paradise.” The ruler of this island, Queen Califia, ruled an empire without men, and gave riches away wherever she traveled. It took several hundred years for the world to recognize that this place did exist, but it wasn’t an island, and it had both men and women. In 1776, just as the U.S. was being formed, Spanish explorers settled it once and for all that California was very much connected to a larger land mass on the North American continent, and was populated with both sexes. A mural at Mark Hopkins Hotel in San Francisco depicts Queen Califia, the ruler of a fictitious place for which California was named. From 11 April to 29 August 2010, the Château de Malbrouck will present an exhibition dedicated to the work of Niki de Saint Phalle. 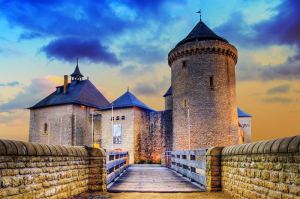 The completely restored 15th-century Château de Malbrouck is located near Metz in northeastern France, just a stone’s throw from the German border. This exhibition is made possible through a collaboration with the Niki Charitable Art Foundation. Watch this space for more information.